Jacksons used Safelane on the M25 for the Newhall Joint Replacement Scheme. The scheme was to replace a multi-element expansion joint between junctions 10 and 11 on M25 clockwise and anti-clockwise. They were surprised by how easy it was it install. 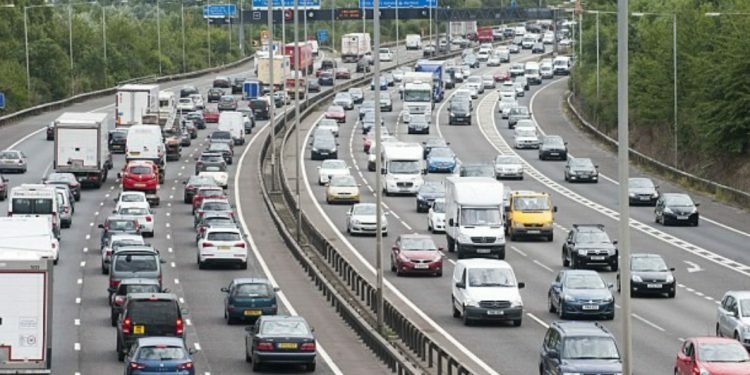 As the main contractor, Jacksons asked Highway Resource Solutions to design a Safelane system for a full carriageway closure on the M25 anti clockwise. 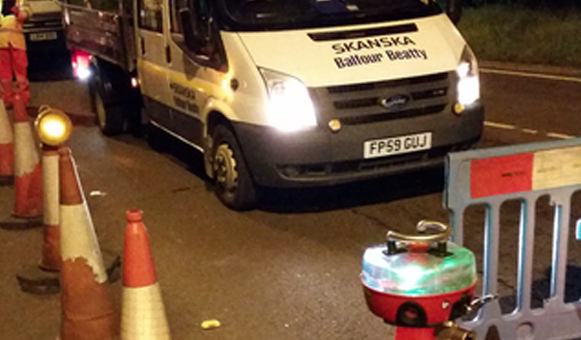 Jacksons crews were surprised by how easy Safelane was to install, having been weary of it to begin with, they soon had a complete change of heart. 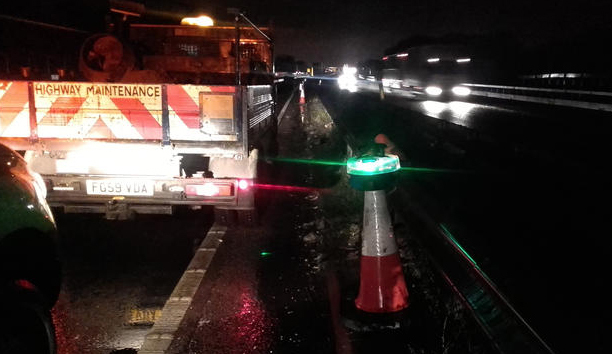 Aone+ deployed Safelane on the A5 at Mancetter Island which was closed for resurfacing work. All manned access points were equipped with Safelane Panic Alarms, as well as full road closures complete with Intellicone Cone lamps. For safety, manned checkpoints were installed ahead of the workforce. Gate System at the Checkpoints, and how well it worked in conjunction with the Safelane System. As the TM operative was speaking, an alarm was triggered on the orange unit. A confused driver had become mixed into site traffic. When the crews arrived at the Checkpoint, each site vehicle was allowed in until the errant one was located. The driver was then asked to pull over while the site traffic passed. After waiting for a few minutes the TSCO arrived and the motorist was escorted from site. The operatives were pleased that the system had done its job. Safelane has once again helped to prevent injuries and fatalities which can occur from the ignorance of drivers. 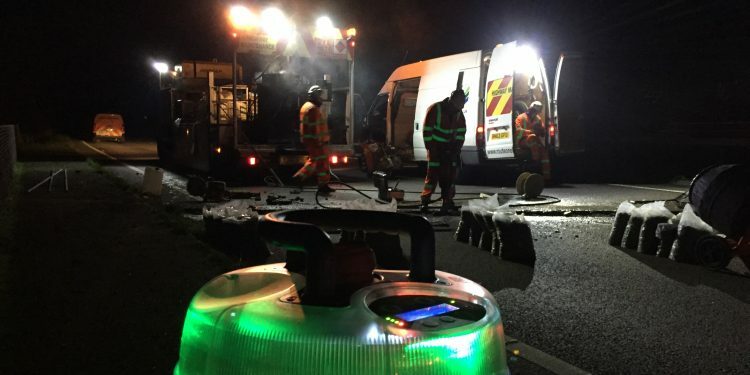 Ringway Infrastructure Services have deployed the Intellicone® Safelane equipment to help improve their safety protocols during the resurfacing works on the B 1261, Crossgates to Musham Bank. The works were carried out during the daytime on a busy B-road that cuts through a residential area. As such, Intellicone® enabled full road closures were required to prevent access from the A64 and from the housing estate. Access to site was through a manned chicane, where an R-Series PSA was placed, which included a CCTV camera, both to be activated by the operatives Panic Alarm. 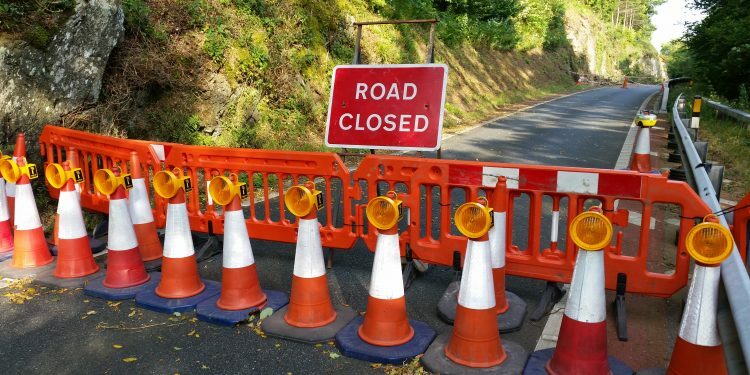 If the full closures or the access points were breached by an errant vehicle, the strategically placed Crew Alarms would be instantly activated allowing the works crews to seek safety. An Airlock entry system had been placed on the M25, junction 30 slip road onto the A13 by Skanska Balfour Beatty . To enhance the Crews safety, the Intellicone Safelane Panic Alarm/ Gatemen system had been deployed. The work crews who were resurfacing the highway were only 1/2 km further down the road. A few hours into the shift, the closure was breached by a white Bedford truck driver. The Gateman immediately triggered his Panic Alarm, simultaneously setting off the Blue Crew Alarm, alerting them to move to safety. 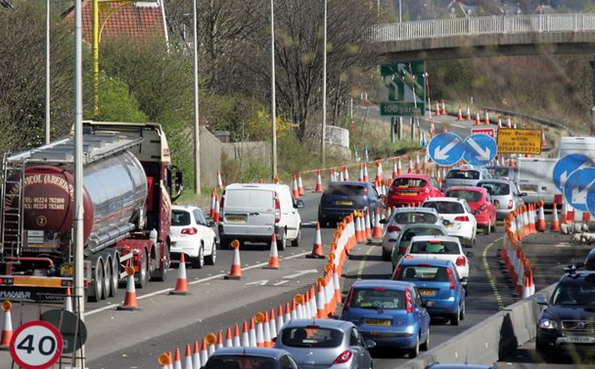 As the rogue driver saw the mass of flashing beacons in front of him, he sped up and forced his way through the holding point barrier, through the remainder of the roadworks and off site. All with the blatant disregard for the workforce. 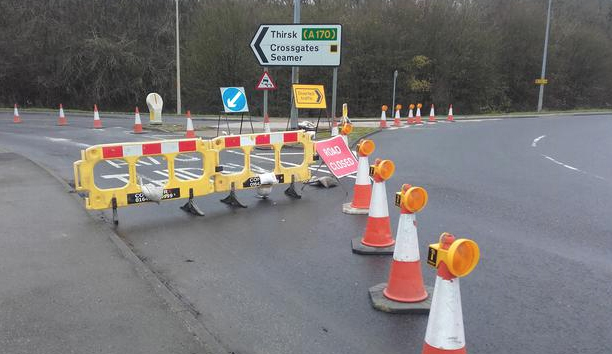 The Safelane system was used to close 10 miles of the A5 between Towcester Racecourse and Old Stratford roundabout. The closure required 2 checkpoints with airlocks (Orange Alarms), 2 works access points (Red Alarms) and 15 full closure points (Yelllow Alarms and Intellicone lamps). In additon there were 5 Blue Alarms for the workforce operating inside the closure. When the member of the public attempted to gain access via a full closure point and was dettered by the Yellow Alarm, this also alerted the Traffic Management Operatives situated at the Checkpoint (Orange Alarm) with CCTV and Panic Alarm). If the member of the public would have proceeded towards the checkpoint and posed a threat to the workforce the Traffic Management Operatives manning the checkpoint could have sounded the Blue Alarms of the workforce. In this case the incursion was contained and there was no need to alert them and halt work unecessarily. 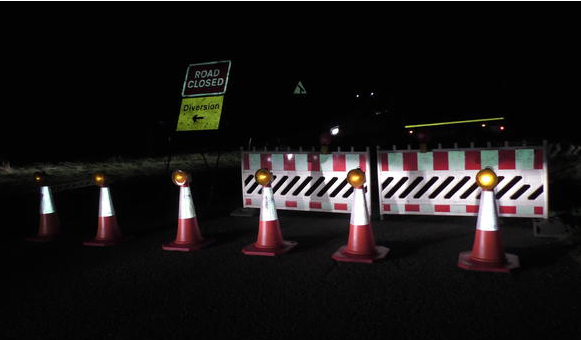 The Safelane system was deployed on a full road closure on the A66 near Bassenthwaite Lake to provide and advance warning to the workforce on any incursions by vehicles, cyclists or pedestrians. 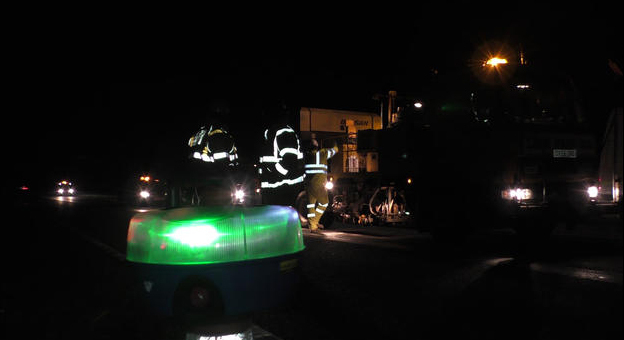 The Intellicone enabled cone barrier was set up with an Intellicone Portable Site Alarm to act as a deterrent and an Intellicone Portable Site Alarm near the workforce.